Welcome! 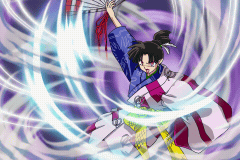 This website is about the Inuyasha GameBoy Advance game called "Naraku No Wana! Mayoi No Mori No Shoutaijou". Naraku No Wana! Mayoi No Mori No Shoutaijou is a Gameboy Advance game based on the anime series Inuyasha. Using Google, I only came across a few worth while sites about the game which I have listed in the Links section. So I decided to make a website about Naraku No Wana to help out others who might like to play this game. Vote Inuyasha Advance for Inuyasha Top Site! Some item name translations have been added to the Items section, and a Koukan Points guide added to the Walkthrough. I've added information to the Battle Escape section, all I have to do is add some screen captures and explanations to complete that section.